The G84-LS is a powerful, rugged, compact split riveter designed for ergonomic, high-speed and reliable operation. 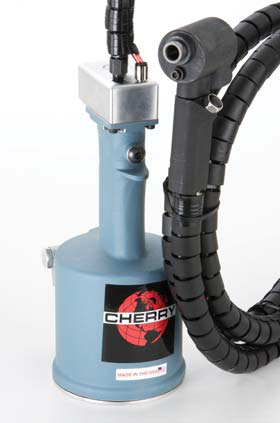 Adapters are available for mounting most Cherry and Huck nose assemblies, and it will install 1/8″ through 1/4″ diameter aircraft structural fasteners such as lockbolts, blind bolts, and blind rivets. See the specific fasteners this tool will install and pricing by clicking this link. This tool may be configured for comfortable left-hand, right-hand, inline, or pistol-grip operation. This allows for superior ergonomics and greater accessibility in obstructed fastener installation applications. Please call Innovative Tooling Services if you have any questions about this tool or would like to see an on-site demonstration!